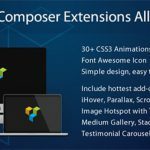 Visual Composer Extensions All in One v3.4.5 put all my exist Visual Composer add-ons (52 elements, $200+ value) in one bundle for only $18, and will add more add-ons for free in the future update. All the add-ons are in a simple design and extend Visual Composer with more function. 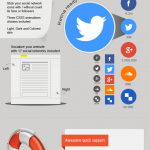 This bundle works fine with VC that installed as plugin or in a theme. Note: Visual Composer Extensions All in One v3.4.5 requires Visual Composer Page Builder v4.9.2 to be installed and activated on your site. Some of the 3D CSS3 transition features are only available in modern browser like Chrome, Firefox, Safari, Opera or IE10+. The HotSpot element need the frontend editor enabled to drag to update the icon’s position. After update to version 3.2.8 and Visual Composer 4.4, there is built-in Icon Picker for the Sticker, Flip Box, Cube Box, Side by Side, Separator, Material Card etc. See a Youtube video demo With this update you can add icon more intuitively and with more icon options, include: Font Awesome, Open Iconic, Typicons, Entypo, and Linecons. – Improvement: add new style option for the Profile Panel, now you can display avatar and title on the header image, and text beside the avatar.